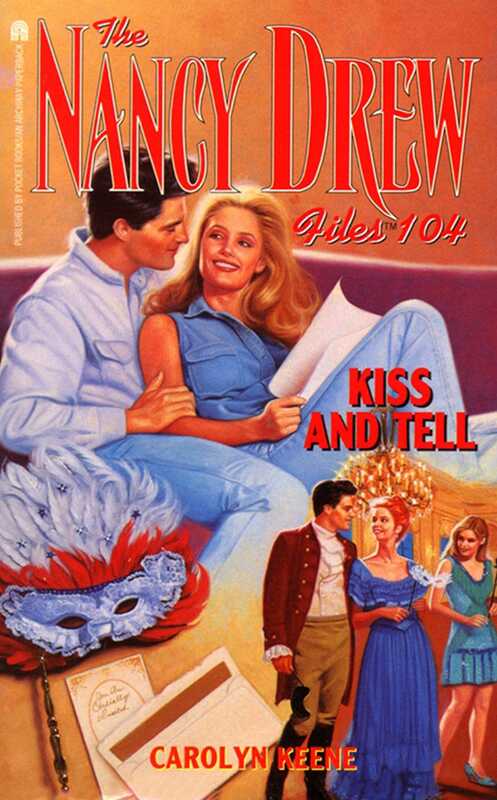 A TASTE OF ROMANCE LEADS NANCY TO A RENDEZVOUS WITH DANGER! Esme Moore, America's hottest romance writer, has come to River Heights, and the rumors are swirling. She's written her autobiography, a book of true confessions, and the scandals are sure to explode off the page. But someone has vowed to kill the book -- or Esme -- before her revelations come to light. It's up to Nancy to find the source of the threat. Speaking of scandals, Nancy may be on the verge of starting one of her own. A handsome young River Heights detective has joined her on the case, and Nancy's beginning to wonder if romance is simply in the air. But for now, she must attend to the intrigue at hand: the web of jealousy, suspicion, and betrayal that threatens to destroy Esme Moore. "Do I look okay?" Nancy Drew's friend Bess Marvin asked. "I mean -- do I really look okay?" Bess straightened her black velvet choker and pushed back a strand of blond hair. "You look terrific!" Nancy said as they pulled away in Nancy's blue Mustang. "Gosh, Bess, you'd think you were going on a date with a hot new guy instead of to a book signing at a stuffy downtown hotel. If I didn't know how much you love romance novels, I'd wonder what had gotten into you. " Bess had pulled down the sun visor and looked in the mirror to examine her makeup. After reapplying a coat of Fabulous Grape lip gloss, Bess turned to address her friend. "Nancy Drew, you know Esme Moore just happens to be the hottest romance writer going, and this is a very special occasion. Esme hasn't been home to River Heights for years. And she's planned an incredible few days to celebrate her home coming. " Nancy negotiated a turn and whipped onto the expressway headed toward downtown River Heights. Once she'd gotten them safely into the flow of traffic, Nancy smoothed her reddish blond hair back behind her ears and said, "What exactly is planned?" "Well -- you won't be disappointed," Bess said mysteriously. She rummaged around in her purse and brought out a well-thumbed brochure that had a bright red heart on its cover. "Esme Moore's new book is called Passion, and it's being released this weekend, in time for Valentine's Day." Bess's sigh was full of longing and despair. "What I wouldn't give to have a date on Valentine's Day this year!" Bess said, forgetting to tell Nancy the weekend plans. Nancy smiled her understanding. Bess had fallen hard for Kyle Donovan, an assistant in Nancy's father's law office, but Kyle was now in law school, and Bess rarely got to see him. Besides, when Kyle left to start school, he and Bess had agreed that the mature thing would be for them to cool their relationship. They visited each other occasionally, and they dated other people. Still, Bess hadn't met anyone who set her heart pounding as Kyle did! "I've been there," Nancy said reassuringly. "Oh, Nan," said Bess, her blue eyes reflecting her concern. "I should have remembered. You of all people know what it's like to keep up a long-distance romance. Maybe Ned will surprise you for Valentine's Day. " Nancy became pensive at the thought of her boyfriend, Ned Nickerson. Since he went to Emerson College, Nancy only got to see him on vacations and holidays. Unfortunately, Valentine's Day was neither. It hadn't been easy for Ned and Nancy to maintain a long-distance relationship, and there had been times when their feelings for each other had been put to the test, but throughout it all they managed to remember how important they were to each other. Until recently, that is. Lately, she and Ned had been fighting a lot, and Valentine's Day was the cause of one of their fights. Ned was busy with a big research paper and wanted Nancy to come to Emerson for a visit, but Nancy had promised Bess to go to Esme Moore's book signing. She didn't want to cancel out on her friend. The last time she talked to Ned about it, he'd been hurt and disappointed, and Nancy felt bad about letting him down. Still, there was nothing she could do. She'd promised Bess. "Do you think he'll surprise you?" Bess pressed. Shaking herself out of her reverie, Nancy went back to paying attention to the light early-afternoon traffic. "I'm afraid not, Bess," she said, starting off the exit ramp. "Ned's got a paper due next week, so he'll be grinding away all week end." "Kyle's the same way," said Bess with a laugh. "Even he didn't expect law school to be so tough." For a moment Nancy glimpsed the sadness on her friend's face and understood how hard the separation was for Bess. A moment later, though, Bess's face brightened and she was checking her makeup one last time. "If I happen to meet some gorgeous guy today, and if he happens to be interested in me, and if I like him, too, do me a favor, Nan." "Remind me not to get serious about him, " Bess stated flatly. "Kyle Donovan was it for me. I am never, I repeat never, getting serious about another guy again! It hurts too much when it gets complicated." "I know, Bess, and don't worry, I'll remind you," Nancy promised. Nancy was familiar with the hotel where Esme Moore was holding her book signing, because her father, Carson Drew, had his law offices nearby. Esme had a full schedule of events at the Barrington Hotel to celebrate the release of Passion and her birthday, which just happened to fall on Valentine's Day, Bess explained. Both girls drew in a sharp breath as they pulled into the Barrington's sweeping, circular driveway. Limousines lined the way, and the hotel's door men and porters were busily escorting well dressed guests and all their luggage through the brass-accented revolving doors. "Wow," said Bess. "Esme sure has rich friends. Are we dressed up enough?" "For a book signing?" Nancy asked. "I should hope so. Who are all these people anyway?" Bess stepped out of the car, smoothed her green velvet dress under her wool plaid coat, and nervously fingered the choker at her throat. "Esme's a star, Nancy," Bess said. "With star power." Nancy buttoned her green coat and gave the valet her keys before joining Bess at the hotel entrance. Just ahead of them an attractive blond woman turned to the man she was with and said, "Do you think Giancarlo will be here?" "Does she go anywhere without her mascot?" the man shot back. The two broke out in laughter and headed for the registration desk. "Did you see who that was?" Bess whispered at Nancy after the couple was gone. At Nancy's blank look, Bess rolled her eyes and said, "Lee Michelle! Esme's archrival. I can't believe she's here. And look -- " Bess pointed out a tall, brown-haired man at the elevators. "That's Todd Gilbert." "Not the Todd Gilbert," Nancy said. "The one and only," Bess said, watching Todd disappear into an elevator. "I read in Faces magazine that Todd's trying for a comeback -- with a part in the movie version of Telling All, Esme's soon-to-be-released autobiography." Nancy nodded almost without thinking. Bess had been filling her ears with Esme trivia since she'd found out that her favorite romance writer was coming to River Heights. Along with Esme's novel Passion, her autobiography, Telling All, was to be published soon. The author was still making last-minute revisions to the autobiography, but already there was intense interest in the book, both from the public and from the various people Esme had known and about whom she was writing. "I bet this place is full of people who would love to get their hands on a copy of that manuscript," Bess said. "Esme's promising to tell the truth, the whole truth, and nothing but the truth. There are a lot of powerful people who wish she'd lie about them -- at least just a little!" "Look," Nancy said, pointing to a dark-haired woman striding purposefully through the lobby. "Brenda Carlton!" Bess said. "Two guesses what she's doing here." Nancy shrugged. "Her father must have sent her to cover the event for Today's Times. " "Watch out," Bess warned. "She's coming our way. " A moment later Brenda Carlton was standing next to them, flashing both Bess and Nancy a huge smile. "Surprise, surprise. I suppose you're here for the same reason I am?" "If it's to see Esme Moore, then yes," Bess offered grudgingly. Brenda's green eyes shone as she flipped back her black hair to announce, "Well, guess who has a hot lead on Ms. Esme Moore?" "It wouldn't be you, Brenda, would it?" Nancy said, raising an eyebrow. "None other," Brenda said smugly. She tapped her pencil on the journalist's notebook she carried and checked her watch. "Unfortunately, I don't have time to stand around and brag. The book signing's supposed to start any minute. See you there! I'll be the one with the shocking revelation." Bess narrowed her blue eyes as Brenda walked away. "I don't even want to think about the sleazy things she's up to." "Lighten up, Bess," said Nancy. "Brenda may go overboard some times, but she's helped us out on a few occasions, too. " "I guess," Bess admitted. "Don't ask me to like her, though." Nancy laughed, happy for her friend's loyalty. Because Nancy was a talented detective and Brenda was a reporter for her father's newspaper, they had gone up against each other more than once, matching investigative skills. Nancy was levelheaded and cautious. Brenda was impulsive and not always careful to check her facts. "Come on," Bess urged. "Esme's book signing is about to start." Bess led Nancy through the hotel lobby and along a plush, carpeted hall. The Barrington had undergone a million-dollar renovation recently, and it showed. The rich, dark paneling had been refinished and the bronze detailing had been polished until it gleamed. On the ceiling, original frescoes from the late nineteenth century were restored, and angels lit the way from on high. In the sun-room the opulence became more intimate. Oversize sofas and armchairs, upholstered in rich browns and reds, were set among expensive antiques. Bay windows lined three sides of the room, and the late-afternoon sunlight cast a warm glow on the oil paintings hanging on the walls. Out the window the room faced an enormous garden. The overall effect was under stated but elegant. "Hurry!" Bess pushed Nancy forward into the crowd. "Esme should be here any minute. I don't want to get stuck at the back." Sure enough, a blond-haired woman dressed in a tailored winter white suit was at the lectern, calling the crowd to attention. Around them, Nancy spotted several well-known faces, including those of Todd Gilbert and Esme's rival, Lee Michelle. Nancy couldn't believe that Esme could attract people like Vanessa Hopkins, the hot model, but there she was, along with her new husband, the rocker Billy Bolt. The couple were sitting next to Jesse Dean, the younger brother of the actor Jackson Dean, and an up-and-coming star himself. It seemed that everywhere she turned, Nancy spotted an actor or musician or writer. "It's like being at an incredible nightclub," Bess marveled, her blue eyes wide with delight. "Wow!" Nancy had to agree. "You were right, Bess. Esme is a star, with real star power." "I told you," Bess said. "Please take a seat," the blond-haired woman urged. "There are several comfortable sofas and armchairs up front." Bess and Nancy sat in the front row. The woman at the lectern introduced herself as Janine Halpern, Esme's publicist. After giving a short introduction in which she highlighted some of the major successes of Esme's career, Janine finished, "But enough about her accomplishments. Let's have you meet the woman herself -- in person. " The sun-room's double doors opened and Esme entered, followed by a stunningly hand some man and a younger woman in black. Esme was dressed in flowing red pants and a matching red silk shirt. At her throat, she wore a double strand of pearls. She strode into the room smiling and confident, her green eyes shining and her dark, shoulder-length hair swinging. "Hello, everybody," Esme said into the microphone, her voice deep and husky. "I see some dear friends here, and I want to thank you all for coming." Esme reached over to the stack of books on the table beside her, picked one up, and held it aloft. The red and gold cover of Passion glinted as Esme showed it to the crowd. "This one is hot!" she said, laughing lightly. "Please don't be shy about coming up to have me sign a copy for you. I promised Janine I'd start by answering questions. Who's first?" A tall, brown-haired girl wearing jeans and a denim jacket stood up and said, "Uh, I was wondering. Is Giancarlo your husband?" The man who'd come into the room with Esme smiled, displaying perfect white teeth and high cheekbones. He stood up in the front row, ran a hand through his hair, a mass of dark curls, and said in a softly accented voice, "I am indeed." "Did you have a question for Giancarlo?" Esme asked graciously. The girl stammered and blushed. "Uh-um, no, not really. I thought I recognized him from his picture. That's all." Esme smiled and said, "Sometimes Giancarlo gets more attention than I do, but I don't mind. I realize he's a lot better looking!" The crowd laughed. Giancarlo blew Esme a kiss and sat back down. Esme answered several more questions, some of them about Passion and how she came to write it, others about Telling All and when it would appear. Nancy found herself mesmerized by the woman -- her charm, her grace, how she put everyone at ease. She had expected that someone as glamorous as Esme might be a little fake, but the opposite was true. Bess, meanwhile, was in seventh heaven. She hung on the woman's every word, laughing at her every little joke. Nancy could tell that Bess would be first in line to buy a signed copy of Passion. Janine was about to call an end to the questions when Nancy saw Brenda Carlton leap from her seat, notebook in hand. "Ms. Moore," Brenda shouted. "The publicity for your autobiography makes a lot of the fact that the book will be the truth, with no holds barred. Is that a fair characterization?" Esme smiled ruefully and scanned the crowd. "There are some people here who would prefer I didn't tell the truth, but, yes, Telling All will be absolutely honest." "Then why is there a rumor in New York that Telling All is going to be a big disappointment?" Brenda pressed. "I don't know what you're talking about," Esme said, bristling. "For example -- " Brenda checked her note book. "Will you tell the real truth about your ex-business partner Barry Hobbes? Or your relationship with Todd Gilbert and why it ended? Or the secrets you know about your rival, Lee Michelle?" Esme stood her ground. "You pretend to know a lot about me. Who are you?" "Brenda Carlton, Today's Times. " "Well, Brenda, I suggest you do some fact-checking the next time you ask rude and unprofessional questions," Esme said. Nancy held her breath. Brenda had bluffed her way through a lot of situations, but Esme Moore was obviously a pro. She stood beside the lectern, her green eyes narrowed on Brenda. "What's Brenda talking about?" Bess whispered. "I think we're going to find out," Nancy said. "You have five seconds to explain your comments," Esme pressed. "I'd be happy to." Brenda lowered her note book and turned her gaze to Esme herself. "I have a reliable source who swears that Telling All is nothing but lies. What do you have to say to that?"